Architects and designers have to think about how those things will actually be made, and there’s no better way to do that than by testing; by actually building prototypes. 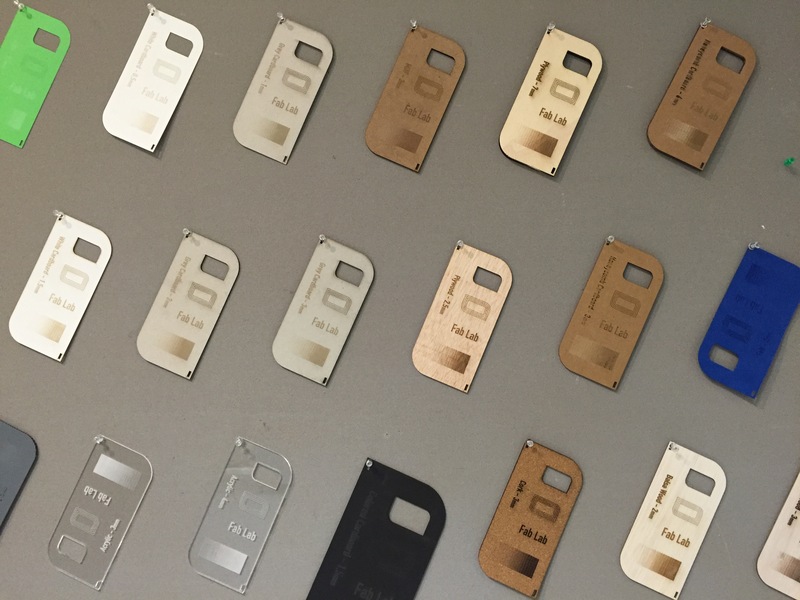 This Fab Lab has two main parts, but collaboration between the two is always encouraged. 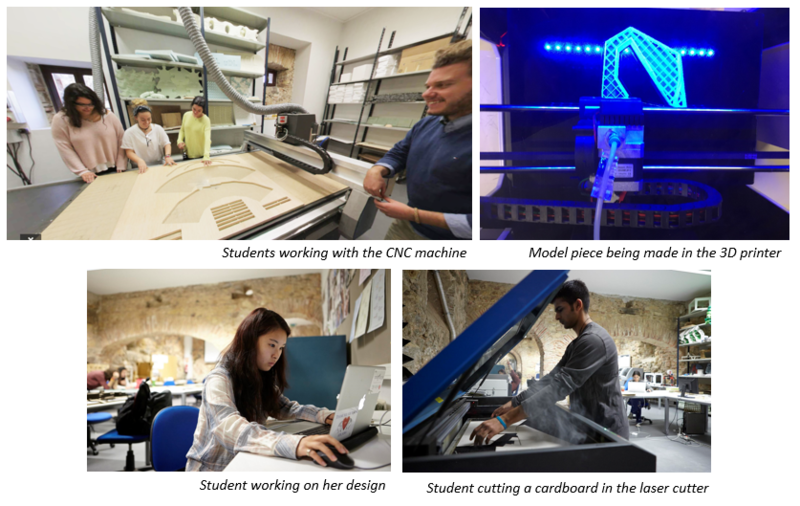 There is the digital fabrication lab that includes machines such as CNC routers, laser cutters, and 3D printers. Most of these technologies involve copying something from the computer, creating a file, and then putting that into the machine and getting something out. The other side is more hands-on, with traditional carpentry tools and shop tools. The aim here is to “think with your hands” put things together, and then, maybe realize that the design can be improved and take it back into the computer, and change your design, and test it again. This way, both parts of the Fab Lab work together seamlessly. How do you start working with these tools if you have never used one before? 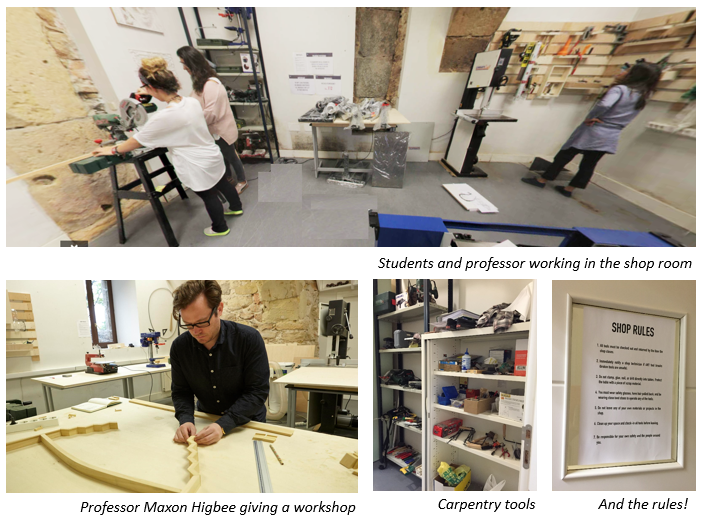 The Fab Lab offers two types of workshops: basic and technical. In the basic workshops, both architecture and design students learn safety and how to use the materials. Later, throughout the year, there are more complex workshops that will give you more skills, technical ability, and material knowledge. You have probably noticed in the pictures that this beautiful lab at our Segovia campus is surrounded by medieval brick arches and stone walls. This is because it used to be the kitchen and pantry of what was formerly the 12th-century convent, Santa Cruz la Real, so our students get to work in a true architectural gem. Another fact that gives the Fab Lab a special ambience is the “Food Corner,” a small and cozy cafeteria with great jazz music where students go to recharge their batteries. Learn more about our undergraduate programs! Click here!